I was provided with one case of Zaycon Chicken to facilitate my honest review. All opinions are my own. For more information, please see my disclosure statement. 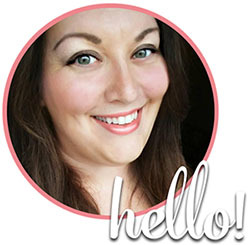 One of the first things I learned when I started our frugal journey, is that you have to change how you shop. One of the best ways to save money on groceries (with or without coupons) is to learn what a “good” price is for your area, and when products hit that rock bottom price, you STOCK UP. 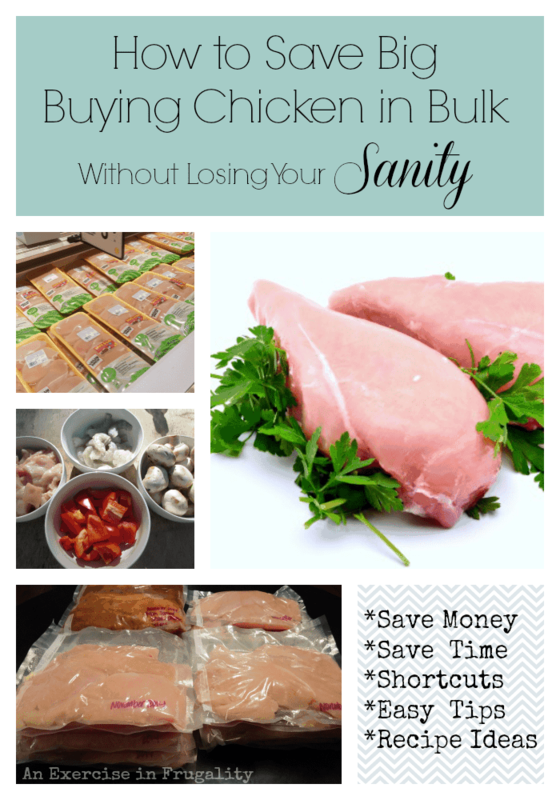 So where do you find the best deals and the cheapest chicken breasts? I have learned that since moving to Oregon, it’s often difficult for me to find chicken for less than $2.99 per pound. SOMETIMES I find them for less, one time I found them at a remarkable price of $1.99 per pound, but there were limits as to how many you could buy. I learned to improvise: My local Safeway stores mark their meat down to 50% off the day before their sell-by date. While this makes for good savings, “pickins” are usually slim (some packages already start to look questionable, or are leaking, or there isn’t any of the cut I want). Sometimes they don’t have any chicken marked down for example, or they only have one paltry poultry package (say that 3 times fast!). After doing a bit of research, I knew I was going to need a better way to consistently get our meat at a better price than the grocery store. YEOWCH. Seriously? “Low” price, Safeway? Are you sure about that? Definitely NOT the cheapest chicken breasts. This is painful! See that pack date? I picked my chicken up on 11/06/14. That means it was in my hands THREE days after being packed. No more expiration-date chicken for this girl! This stuff is fresh. No sketchy chicken, no frozen hockey-puck chicken. This is the real deal ladies (and gents!). They certainly earn the name Zaycon FRESH. So now that you’re ready to order 40 pounds of chicken, you might be overwhelmed or even hesitant like I was. What are you going to do with 40 pounds of chicken? Easy. My recommendation is that you prep some of it (half or a quarter of the breasts) immediately into freezer meals. Throw a few simple ingredients in with your chicken, seal and freeze. Voila. Instant meals ready for your oven or slow cooker. 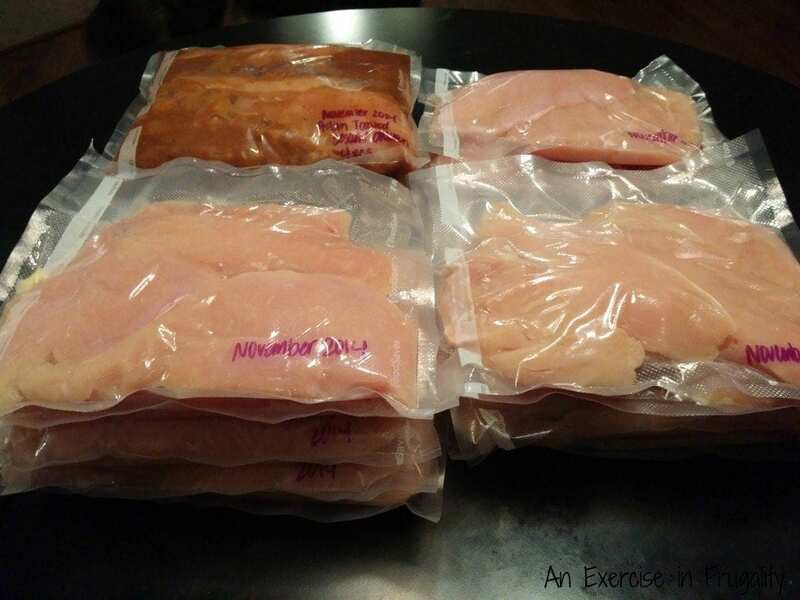 By combining your chicken prep with freezer meal prep you will save tons of time! Some folks may prefer to slice into strips and pre-cook on the grill, or marinate. It just depends on how you will use your chicken. I wanted to have some pre-made freezer meals for lazy days, but I also wanted flexibility to make something if I had the time desire. Plastic garbage bag- The one they put down in your trunk before they give you your box of chicken works great as a disposable table cloth. EASY clean-up is key! Electric meat carving knife–makes the cutting/trimming process SO much faster and easier! This is the one I have and I LOVE it. Sharpie marker-for labeling date, recipe name, cooking instructions, etc. Most of the breasts look like this. To get the weight to be 40 pounds or slightly more, sometimes they throw in pieces that are already trimmed, or smaller, or single breasts. 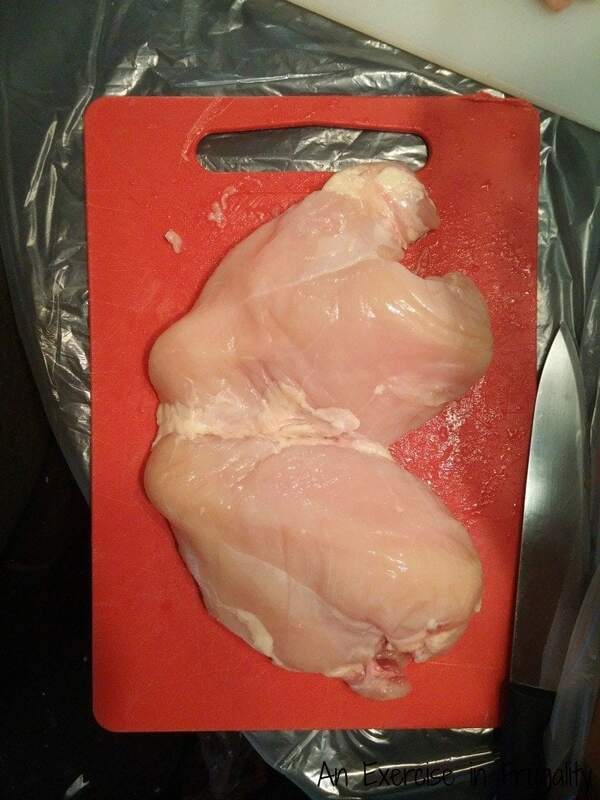 So what I do is, I cut the full breasts in half, down the middle between the two breast pieces. I cut that middle section out so that both pieces are even. Trim off any fat or odd-shaped bits and put them in a pot along with any of the other smaller pieces they put in for weight. You can make pre-cooked shredded chicken to use in recipes with these odd pieces. No waste! Since the breasts are SO large (I still giggle when I say “large breasts”. I am so immature…) I actually wound up filleting them in half width-wise too. Also, check out my post Fun With Freezer Cooking for some of my other best tips, and a few more great recipes! When you freeze the bags, make sure to remove excess air by hand if you’re using Ziplock bags, or with the FoodSaver. I like to lay my bags totally flat on a cookie tray or board in the freezer so they freeze as flat as possible. That way they can be neatly stored standing up once frozen. You’ll need plenty of room in your freezer (if you don’t have a chest freezer, I HIGHLY recommend getting one. Its great to be able to stock up when prices are low but you need the space to store all that loot! Here’s the finished bounty! We will have enough chicken to last us months. Using this method saves me time doing prep, AND money because we are stocking up at the lowest possible price. Looking at the grocery store prices earlier, here’s the breakdown of the savings. They really are some of the cheapest chicken breasts you can find. Obviously, your grocery store prices may vary, but for me, this is a no-brainer! 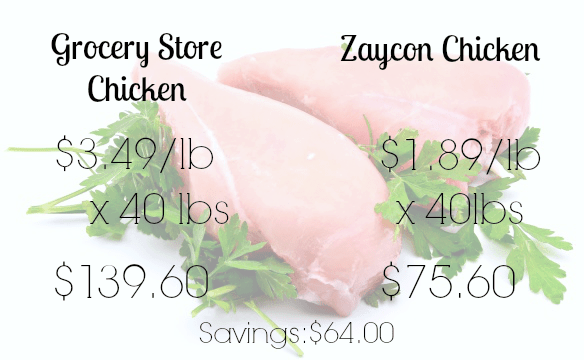 I don’t consider it to be any extra work because when I buy bulk packs of chicken at the grocery store, I have to do the same prep work as I do with the Zaycon Fresh chicken, the only difference is this way, I do it ONCE and I am DONE for a long while! This was my first experience with Zaycon Fresh and I have to say I was REALLY impressed. Not only with the quality (fresh, never frozen, no additives, 100% natural chicken), but with the company itself. 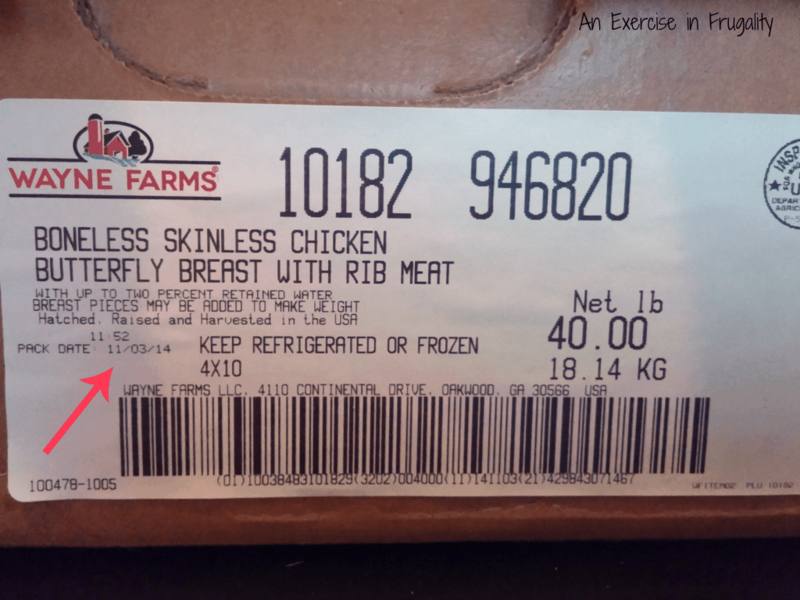 Between when I ordered, and when I received the product, the prices of poultry skyrocketed. They had to raise their prices along with everyone else, clearly including Safeway. However, they quickly found out that they were able to get their chicken at less of a cost than originally announced. What did they do? They refunded customers the difference! I thought that was such a great and honest way to conduct business. Before anyone complained, before anyone even really knew they were accidentally over-charged, Zaycon Fresh stepped up and corrected the price AND refunded the customers with the difference instead of just pocketing it. That to me is a company I want to do business with, and its just one of the reasons I chose to give them not only my business in the future, but also recommend them to my readers! I am really looking forward to trying some of their other products in the very near future. 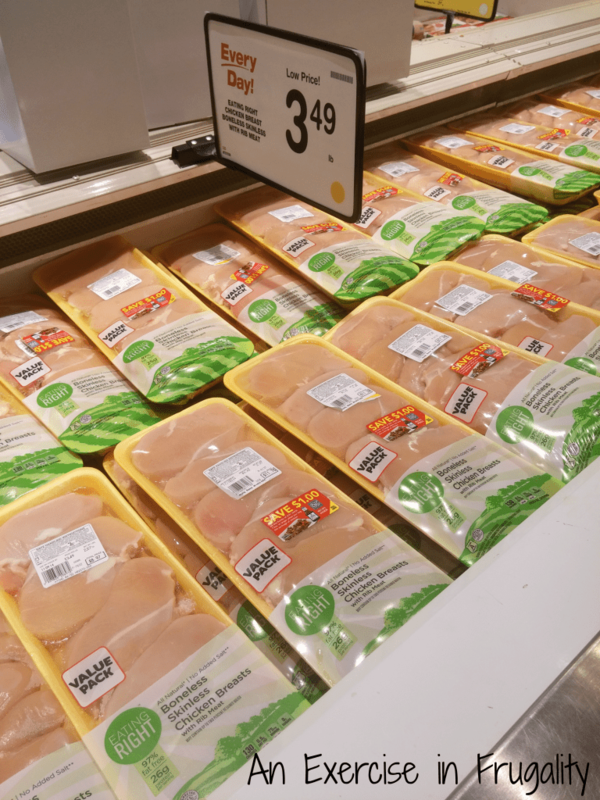 Not only are these some of the cheapest chicken breasts I have ever bought, they are also some of the most DELICIOUS, and freshest chicken breasts too. Have you tried Zaycon Fresh? Tell us below! I wish I was smart and actually had an electric meat carving knife. lol But it did help to have the husband do the packing in the food saver while I cut and trimmed. Took a while with the 40lbs though, but it was worth it cause it saved us buying for 4 or 5 months. None of your Zaycon links are working. It could be because I am on a work computer. Dangit! Thanks Tiffany, they should be fixed now! I am very new to this. I cannot figure out how to get more than one of an item if it says one per customer. How and when can I get more than one. Do I have to make separate trips to the store? That depends on the exact wording. If the wording is “one coupon per purchase” that means one per item being purchased, not one per person. If it says “one per transaction” then you would have to do multiple transactions to get more than one. If it says “one per person”, then technically the limit is one per person, but often people will go back for an additional transaction, or go to another store. Hope this helps!